Approximately 80% of school-based learning is accomplished visually. Despite the obvious link between vision and learning, many parents seem to be unaware of this, and don’t get their child’s eyes checked often enough. It’s important to know that because vision in kids changes, regular eye exams are crucial to their classroom success and self esteem. It is especially important to look out for the signs of vision problems as your child progresses in school. Impaired vision and increasing visual demands like small type in textbooks may noticeably affect their academic performance. Technology that’s recently been integrated into the classroom, like interactive whiteboards, can also potentially provoke less obvious vision problems. Without adequate vision, kids can be at a disadvantage not only in the classroom, but also mentally, physically and emotionally. If your child has already been tested for and fitted with glasses, the start of the school year is a good opportunity to see if their prescription is still adequate. 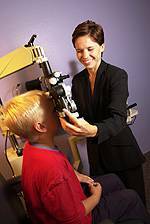 Even though your child might be able to see well wearing his or her older glasses, they may need to be adjusted or perhaps the lenses are not optimally positioned anymore due to normal development. If you want a child to wear his glasses, he better like how he feels in them! So be sure to make an appointment to see us when you’re gearing up for the new academic year. We’ll help your child commence the new school year with their vision in check.